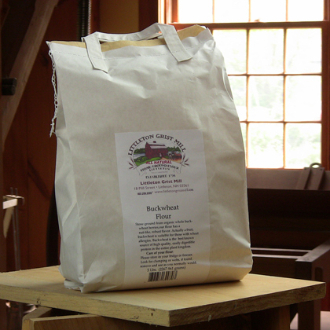 Our , stone-ground buckwheat, from U.S. buckwheat berries, has a nut-like and robust flavor. Buckwheat is gluten and wheat-free. It is the fruit of a plant rather than a grain so is suitable for those with wheat allergies. It has been used around the world for hundreds of years and was first cultivated in southwest Asia around 6,000BC. Buckwheat provides vitamins B1 and B2, potassium, magnesium, phosphate, iron, and lysine. Buckwheat bran contains rutin, a flavonoid known to reduce cholesterol, lower blood pressure and maintain the strength and flexibility of capillaries. A recently discovered compound in buckwheat called fagopyritol appears to help manage Type II diabetes.